Shimadzu, one of the world leaders in analytical instrumentation, has announced the release of its IRSpirit series of Fourier Transform Infrared (FTIR) spectrophotometers. The two compact-sized models, the IRSpirit-T and IRSpirit-L simplify analysis and provide outstanding expandability. Acquiring high-quality data, the IRSpirit series is primarily marketed to pharmaceutical, chemical, and food industries, and academic institutions. Despite their compact footprint smaller than an A3 size sheet of paper, the IRSpirit-T and IRSpirit-L provide a wide sample compartment that accommodates existing accessories from Shimadzu and third parties. This capability makes them the smallest and lightest FTIR spectrophotometers in the world that can be used with optional products from other manufacturers. The IRSpirit series also includes the dedicated IRPilot program with 23 application-specific workflows that can be utilized without involving any complicated parameter setup process. Customers can either opt for the IRSpirit-T model, which offers sensitivity equivalent to standard Shimadzu models, or for the reasonably priced IRSpirit-L model. They respond to the increasing demand of recent years, combining small laboratory space with high expandability and ease of use. For these reasons, the development process involved both hardware and software. From a hardware perspective, the new systems provide the same sample compartment width as Shimadzu’s higher-end models despite being only one third of their size. For software, a new program allows operators with minimal analytical experience to acquire high-quality data. Even though the IRSpirit series instruments are small and compact, the systems are as fully controlled as higher-end versions. Status monitoring is also available as well as the diagnostic function. The IRSpirit series have an automatic accessory recognition which is able to assist users during the parameter selection needed for a specific accessory. The installation footprint is 390 mm wide and 250 mm deep, which is even smaller than an A3 size sheet of paper, and the main unit weighs only 8.5 kg. Despite their compact size, they have a large sample compartment that can accommodate existing Shimadzu or third-party accessories, making them the world's smallest (footprint) and lightest FTIR systems capable of using optional products from other manufacturers. Furthermore, the unique design allows the system to be placed vertically in narrow spaces, with the main unit rotated 90 degrees, so that the 250 mm wide side surface is oriented towards the front. A newly developed IRPilot program allows users to quickly start 23 different analysis workflows for such applications as identification tests, contaminant analysis, quantitative analysis, and film thickness calculations. The program can be executed by simply selecting the purpose and techniques for analysis, which enables inexperienced FTIR operators to easily start analysis. The program also includes functionality for registering previously performed analyses, which simplifies the process for frequently performed analyses. The window plate can be replaced with a specialized window plate that protects the optics from high temperatures and humidity. Installing Shimadzu's unique contaminant library or thermally degraded plastics library allows the system to be used for contaminant analysis. Furthermore, the system is controlled via Shimadzu's LabSolutions analysis data management system. This allows integrated management of data with analytical instruments from other manufacturers by connecting them via a network. Shimadzu has announced the release of its IRSpirit series of Fourier Transform Infrared (FTIR) spectrophotometers. The IRSpirit-T and IRSpirit-L compact-sized models simplify analysis and provide outstanding expandability. Acquiring high-quality data, the IRSpirit series is primarily marketed to pharmaceutical, chemical, and food industries, and academic institutions. The new systems provide the same sample compartment width as Shimadzu’s standard model while being only one third of its size. 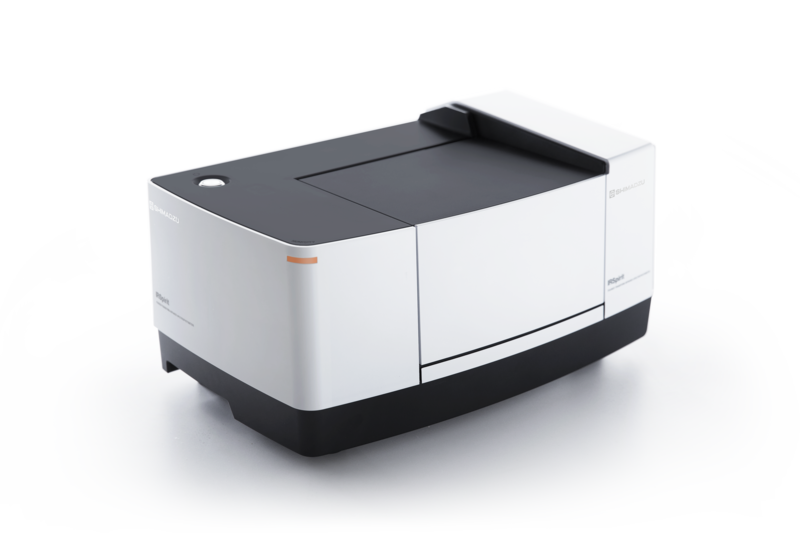 They are the world's smallest (footprint) and lightest FTIR systems capable of using either Shimadzu’s accessories or optional products from other manufacturers. Figure 1: IRSpirit Fourier transform infrared (FTIR) spectrophotometer targeting pharmaceutical, chemical, and food industries, and academic institutions.